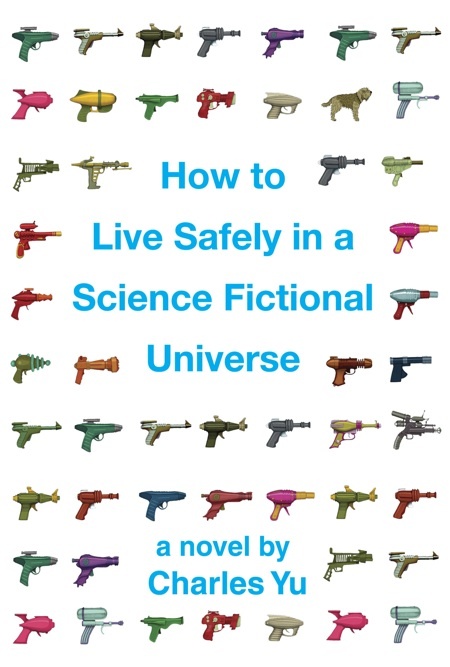 Charles Yu’s début novel, How to Live Safely in a Science Fictional Universe follows the protagonist (Charles Yu) as he goes about his business of repairing faulty time-machines and writing a book called How to Live Safely in a Science Fictional Universe. So, on the one hand, the novel is a meta-fiction, about the process of writing (it also has a few references to popular SF, Star Wars and the like). How to Live Safely in a Science-Fictional Universe is also an excellent story about the relationship that the main character has with his mother and his father. The older Yu is the unfeted inventor of time-travel, and the author had a difficult relationship with him: something he regrets. The novel largely succeeds in holding this together. Fusing entertaining science fictional time travel conceits, like the non-existent dog who keeps him company, his neurotic computer and his software based boss, who doesn’t recognise that he is not a human being with the pain that he feels from the lack in his familial relationships. “At least I have a dog, sort of. He was retconned out of some space western. It was the usual deal: hero, on his way up, has a trusty canine sidekick. then hero gets famous and important and all of that and by the time season two rolls around, hero doesn’t feel like sharing the spotlight anymore, not with a scruffy-looking mutt. So they put the little guy in a trash pod and send him off. I found him just as he was about to drift into a black hole. He had a face like soft clay, and haunches that were bald in spots where he’d been chewing off his own fur. I don’t think anyone has been as happy to see anything as this dog was to see me. He licked my face and that was that. I asked him what he wanted his name to be. He didn’t say anything, so I named him Ed. “This is what I was thinking about when my father, a little out of breath, finished telling me everything he had kept bottled up inside, when he had finally confessed his most guarded dreams and stopped talking. For a long moment, it was silent in the car, and then he turned to me. I shrugged and kept my eyes fixed on the families in the window of the video store choosing their movies together, ready for a night of fun and popcorn. There’s also quite a nice line in technological technobabble, used to explain the time travel in the novel (“chronodiegetical schematics”). This is a difficult course for the writer to plot. As Yu is erring on the side of playful with this, I think, he manages to plot a course avoiding the danger of creating a mocking pastiche of time travel SF. There’s more than sufficient charm and genuine enthusiasm for SF in this novel to prevent the writing from becoming an ill-humoured parody. Yu writes well; despite some shifts in narrative style he succeeds in maintaining the flow of the novel. Most of the novel is written in the first person – the main character spends a fair amount of his time in his time machine, with no real human contact. There are excerpts from the book itself, with further nods to the SFnal conceits of time travel. Though some of the phrasing is clipped, there are shifts to long, dense sentences, which could be detrimental to the readers enjoyment if it seems to be arbitrary. It would be difficult, however, to accuse the writer of not knowing his craft. I’m a big fan of meta-fictional novels, whether they about books or being a reader (say Italo Calvino’s If on a Winter’s Night a Traveller or Umberto Eco’s The Name of the Rose) or, more like this, the process of writing or telling stories (like, say James Joyce’s A Portrait of the Artist as a Young Man). I’m not going to make the mistake of overstating things and suggest that Charles Yu is writing to the standard of the writers mentioned, but he is clearly a talented writer, he loves writing, he loves SF and what’s more I think he will be someone to watch. Clever, touching and funny: I look forward to what Charles Yu does next. This entry was posted in Review and tagged charles yu, novel, sf, time travel. Bookmark the permalink.